The average cost of raising children in the U.S. is unfortunately rising high. Recent estimates have shown the total cost of raising a child from birth to adulthood (18) can be as much as a quarter million dollars. Some of the costs include clothing, feeding, education, you know, the normal expenses to certain stages of a child’s life. One of the highest expenses one can “look forward to” is child care plans. Part of these cost are due to the increase of childcare costs. Americans are spending an ridiculous amount of money to have their children looked after. This is due to people not having the recourse necessary, such as a stay-at-home parent, or a relative who can look after them. Daycare has become the most common factor for a family with two working parents who need a full-time care facility. In these situations, the cost of these facilities becomes a regular expense, equivalent to a mortgage or rent payment. While every city is different when it comes to cost, on average, Americans are spending huge portions of their annual income come on these daycares. Business Broker Network, an online marketplace for business up for sale, created a map showing the average cost of child-care in every state. Which state is the highest? None other than Washington, DC, where parents are spending from 2,982 per month or $35,782 per year! Yes, you read that right, per year! Next up on the highest list is Massachusetts, where the cost is $2,452 monthly, or $29,426 annually. New York comes close in third at $2,009 monthly or $24,102 annually. 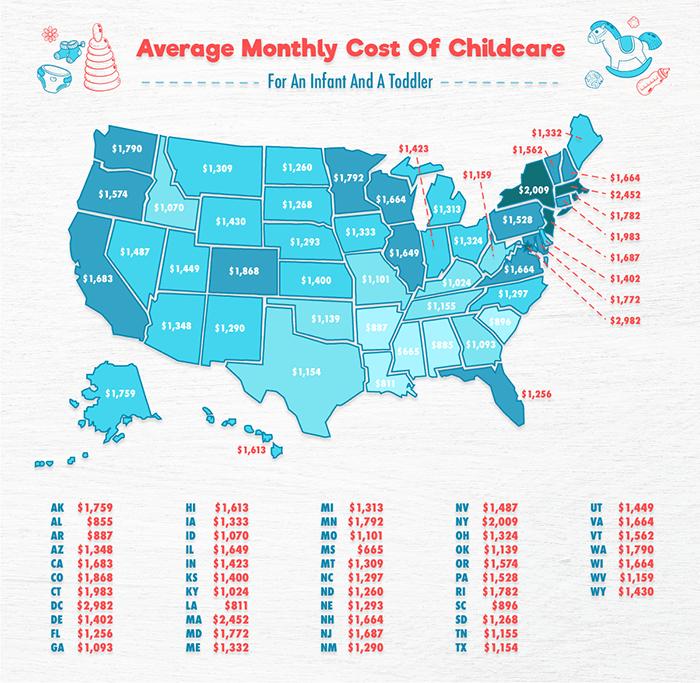 Which states have the lowest childcare cost? Kentucky, Arkansas, South Carolina, Louisiana, Alabama, and Mississippi. What does this mean? Well, if your partner or you are planning on going back to work, unfortunately, you can expect to be spending over $1,000 per month, depending on your location. Kids are expensive! 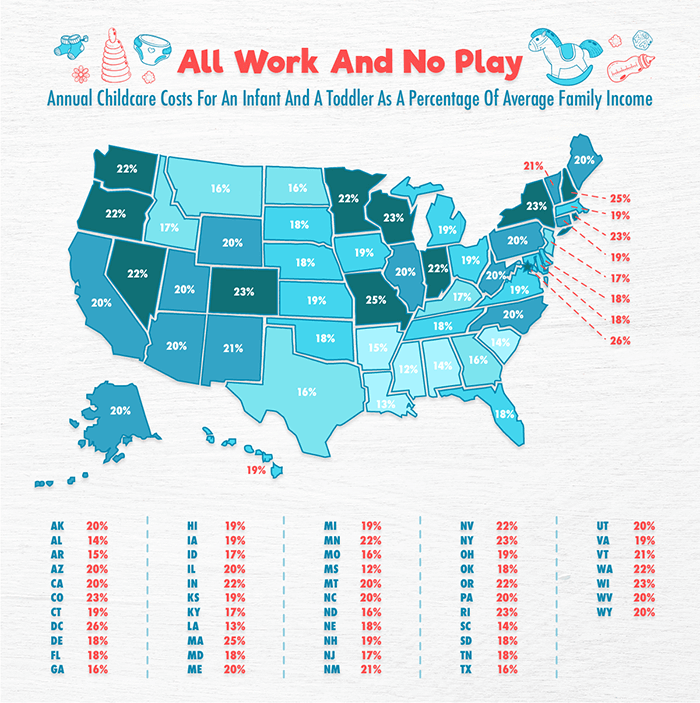 Don’t believe us, check out the map below showing the monthly costs for infant care and toddlers in the U.S. Each comparison shows each state’s annual child care cost as a percentage for one median family income. Once more, we see D.C. and Massachusetts are the highest ranked, with over a quarter of an average family income needed to cover childcare cost. When compared to the average rent price for a 2 bedroom apparent, only five states (Mississippi, Hawaii, Louisiana, California, and South Carolina) has a child-care for a toddler or an infant that was less expensive than cost of rent. 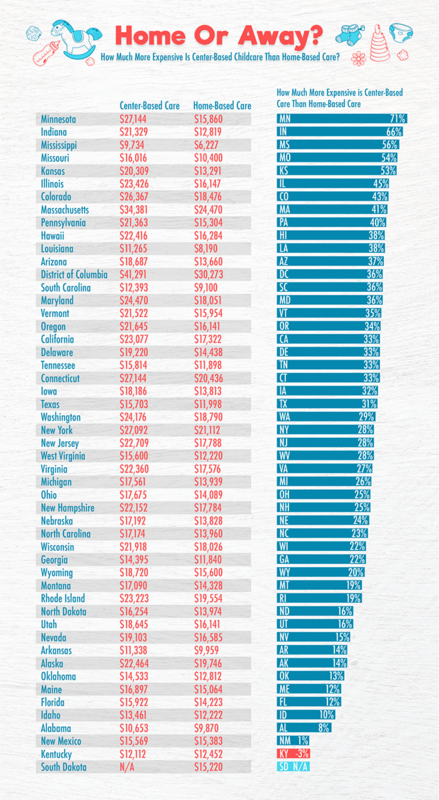 The highest being Wisconsin, where childcare costa almost twice as much as rent! No, these numbers are definitely not to scare anyone from starting a family, but there should definitely be a financial plan to help out the situation. For some, home-based child care may be convenient than childcare centers, making it easier on their financial situation. For money conscious parents, you may want to look for an alternative when it comes to after school sitters, or home based cares. For example, in Minnesota, it is 71 percent more expensive to send a child to a”formal childcare center” than it is to find a home-based alternative. As we said, children can sometimes be expense, especially if childcare plays a big part in your family situation. Yet, parents all around can always give you five more reason as to why sometimes finances aren’t a worry when it comes to starting a family. Sometimes, the love they get from their children is worth more, than the cost. So our best advice, would be to track your finances and enjoy your children as much as you can!